As we plow through more wet snow, a bike pic to remember! This wheelie Wednesday or Hump Day, take a chance. If life were a fat bike trail a wheelie could help smooth out your day-to-day ride or aid you in dropping into your sweet spot. Why not review the following tips to make your week an adrenaline high? 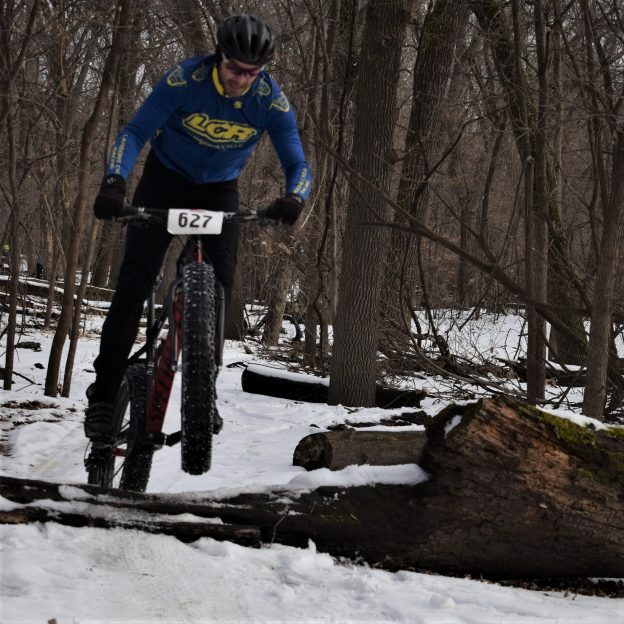 This photo was taken in January at Race #1, at a Get Phat with Pat event in the Minnesota River Bottoms, in Bloomington, MN. This entry was posted in Picture of the Day and tagged #30 days of biking, bicycle lifestyle, Bloomington MN, fat biking, Get Phat with Pat, Minnesota fat biking, Minnesota Mountain Bike Trails, Minnesota Off-Road Cyclists, Minnesota trails, MORC, mountain bike fun, Mountain Biking, Penn Cycle, picture of the day on April 11, 2018 by Russ Lowthian.